Rezeck, Latvia… 1941 – Haim Israelit was a neighbor of Anna Arcichovska and her children, Jadwiga and Jan. When the Germans invaded Latvia, they launched an Aktion against the Jews, killing everyone in Haim’s family – his parents, wife, sister, and cousins. During the Aktion Haim and his nephew, Yakov, were in the cellar and managed to escape the Nazi raid. 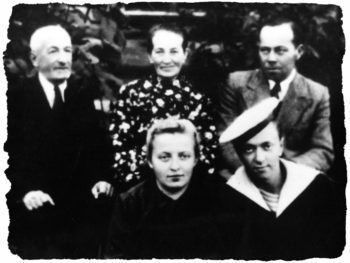 Haim sought refuge for Yakov and himself with the Arcichovski family. Anna agreed to hide them. Next to Anna’s farm was a deserted house; she darkened and sealed the windows and locked the door. The family hid Haim and Yakov there until the Germans came and asked for the keys. Anna told them to come back later when her son, who had the keys, would be home. Anna quickly took Haim and Yakov to their barn where she hid them in the loft under the straw. Later, the family made a small hiding place in the loft. Each day Jadwiga would bring them food in a basket, passing in front of the old house in which the Germans had put families. She would pretend that she was bringing things to the barn. Haim and Yakov lived in this cramped space for more than two years, never venturing out until Rezeck was liberated in 1944. During this time, Jadwiga continued to provide for Haim and Yakov. Jadwiga Arcichovska continued to live in Rezeck until she passed away in 2007.